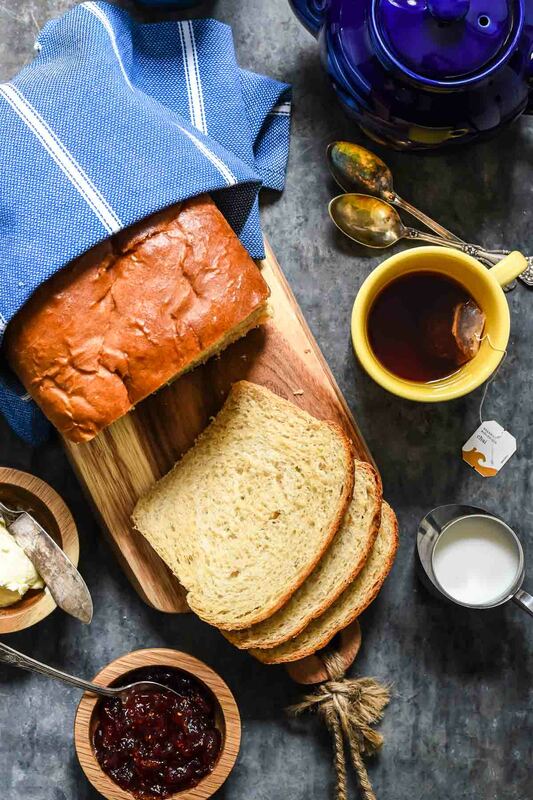 I discovered this Homemade Amish White Bread in the unlikeliest of places, but now it’s become our go-to everyday bread. I was standing nervously in the communion line at my church, caught between the tearing off of the bread and the dipping it in the cup. Our church had been experimenting with different kinds of bread for weeks, trying to find the right combination of sturdy but pullable. This Sunday’s was definitely not the one. It was dry and crumbly, and after giving it a sturdy tug I found myself gripping a piece of bread only slightly bigger than a grain of sand, willing it not to disintegrate in my hand. I wish I could say this was the first time I’ve had an awkward moment in church, but unfortunately I’ve experienced many a communion gaffe. Sipping at the wrong time, spilling juice on myself, eating the cracker when you’re supposed to be praying…let’s just say no one is using the words “proper” to describe me. I often wonder if Jesus envisioned these awkward moments when he instituted communion some 2,000 years ago. Did he think of all the different forms this strange sacrament would take–a gluten free cracker, naan, a loaf of sourdough, even Hawaiian rolls. (Yes, I’ve been to a church that used Hawaiian rolls, and it was kind of amazing). Did he know we’d quibble about whether to use wine or grape juice and have arguments about tiny individual cups vs. a common cup? Did Jesus picture me, standing there crumb in hand, caught in a moment profoundly sacred and yet so very human? Certainly, God has his own way of doing things. If I were God I would’ve picked something much more grand to represent me–perhaps a golden, gleaming statue or a loud and proud orchestral song. I certainly wouldn’t have picked something as commonplace as bread and wine. I suppose that’s why he’s God and I’m not. Jesus was always right there in the thick of things, frustrating people with his normal-ness. Whether he was eating and drinking with rotten sinners, using mud and spit to restore someone’s sight, weeping over the loss of a friend, or washing someone’s feet, Jesus never seemed afraid to dig into the ordinary muck of humanity. These thoughts flash through my mind as I wait my turn in the communion line, then finally decide to go for it, plunging my barely-there crumb into the thinnest drop of liquid. As I do, I thank God for grace and a Savior who doesn’t shy away from our messy, complicated, awkward lives. Then, of course, I pray we find a better loaf for communion. Luckily, a friend of mine took on the task herself, and started bringing a homemade loaf to church each week. If you’ve never sat in a pew a few rows behind a communion table set with fresh homemade bread, you do not know what temptation is. This is THE bread. It’s sturdy enough to hold together, but has a tender, chewy, slightly sweet interior. My friend was gracious enough to send me the recipe she uses. It’s called Amish White Bread. Of course it is. That’s why this stuff is so amazing. Of course, this bread isn’t just for communion. It’s now become our every day loaf. 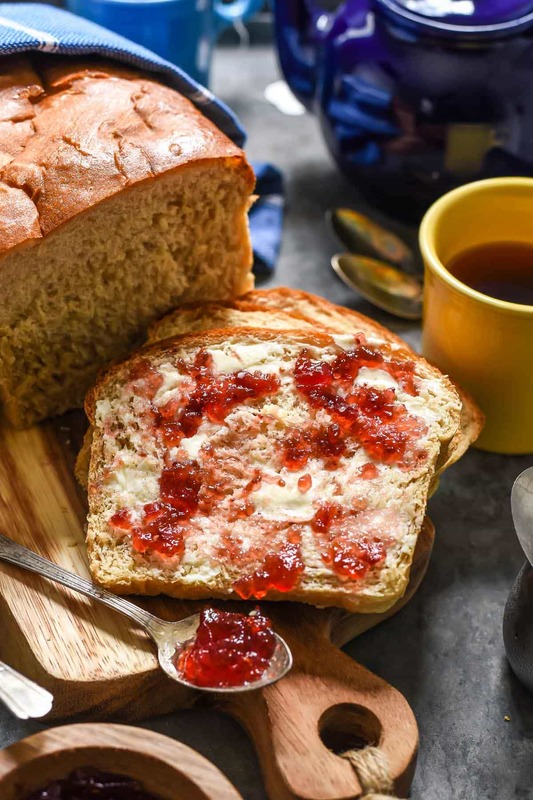 This bread is hearty enough for a saucy, thick sandwich, but it’s also the perfect vehicle for a smear of salted butter and jam. We’ve also found it’s quite useful for soaking up the last bits of a stew or making a killer melty grilled cheese. 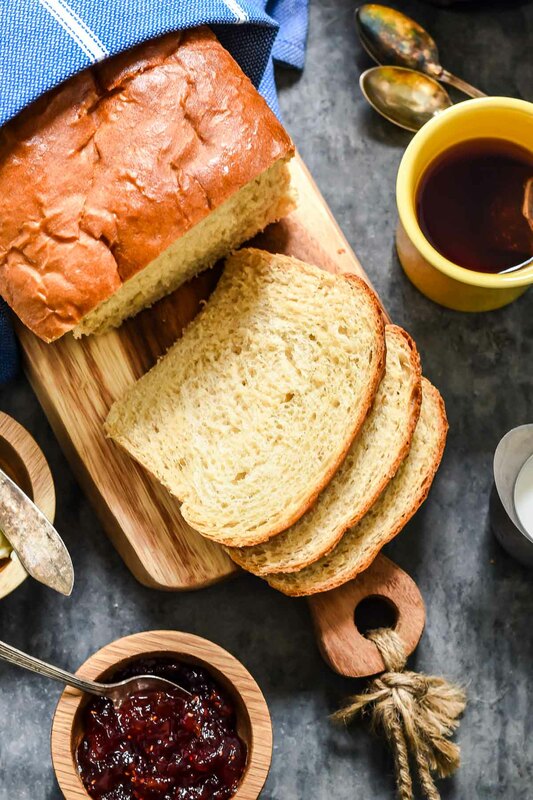 If you’ve never made bread before, this is a great recipe to test the waters. It’s super simple (dare I say no fail?!) and requires very little hands on time. I always find bread making to be therapeutic. It requires you to get a little messy, smell the yeast and feel the warm soft dough working against your hands. The scent of a fresh loaf rising in the oven is more than worth the effort it requires. 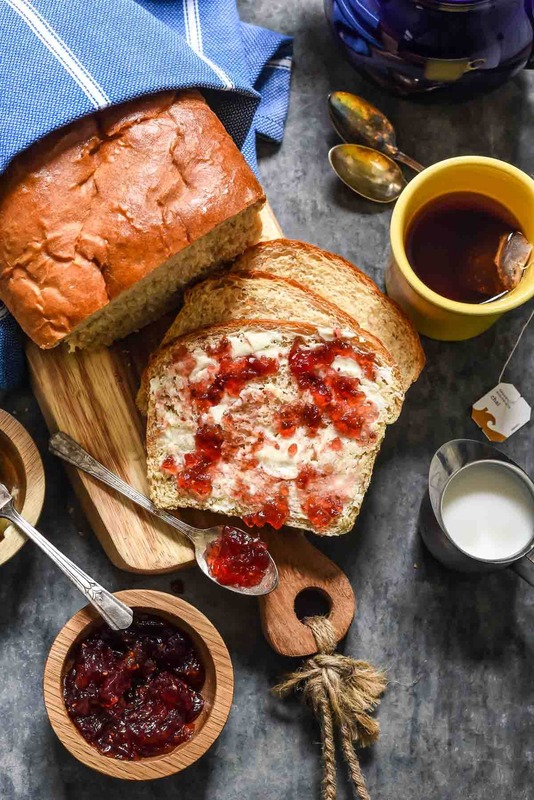 This is a bread to savor and enjoy, a loaf which makes you stop and give thanks, whether you’re standing in the communion line at church or sharing it with a friend over a cup of tea. In the bowl of an electric mixer, mix together the sugar and warm water. Sprinkle the yeast over top, and let it set for 10-15 minutes, or until foamy and bubbly. Stir in the salt, vegetable oil, and half of the flour. Add the remaining flour and use the dough hook to mix the dough together on medium high speed for several minutes. The dough will be pretty sticky. Generously flour a clean surface and your hands. Turn the dough out onto the flour and knead it for 2-3 minutes. Place the dough in a clean, oiled bowl and cover it with saran wrap. Place in a warm place to rise for 1 hour, or until doubled in size. Grease two 9 inch bread pans. Punch the dough down with your fist, re-flour your surface and turn the dough out again. Divide the dough into two even sections (weigh it if you want to be really precise). Press each section into a rectangle, about 9 x 13 inches in size. Roll the dough, starting on the short side. Fold the ends down and pinch the seams together. Place each section of dough in the greased pans. Cover with saran wrap and let rise until doubled again, about 45 minutes. Preheat the oven to 350 degrees. 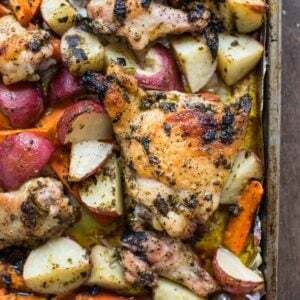 Place the pans in the oven and bake for 25-30 minutes or until golden, deep brown. Remove the pans from the oven and spread the butter evenly over the top. Allow to rest for 10 minutes before moving to a cooling wrap. Store bread well wrapped for up to 4 days or freeze indefinitely. My Heart. And how thankful I am for a Jesus that is right here in the muck of things with us. Willing to die for messy people like us. You and me both! Thank you for taking on the ministry of the bread, friend! Here I thought I was the only one who had the most awkward time with receiving communion! If you can imagine it, I’ve probably done it. This bread looks absolutely wonderful, Courtney — I don’t see any mishaps happening with this one. Love this post so much. You are not alone, sweet awkward friend. 🙂 Thanks so much for your kind words! Baked this bread last night and it was delicious! The only change I will make next time is to not let it rise for the full 45 minutes once its in the loaf pans. Mine was a little too high so the bread was a bit airy. We live in a warm climate (Texas) so bread probably rises quicker down here than it does in Ohio. I would suggest checking it after 30 minutes if you live someplace warm. It makes fabulous grilled sandwiches. I’m so glad it tuned out! I’m sure the warmth probably had something to do with it. I bet your rise times will be shorter. Love Love Love this bread! I made it for our Thanksgiving dinner and I’m getting ready to make it again for Christmas! Everyone loves it and it’s so easy to make! Thank you for sharing, Courtney! This makes me so ridiculously happy Melissa! I hope it was a hit again at Christmas! This bread is like crack for bread lovers! 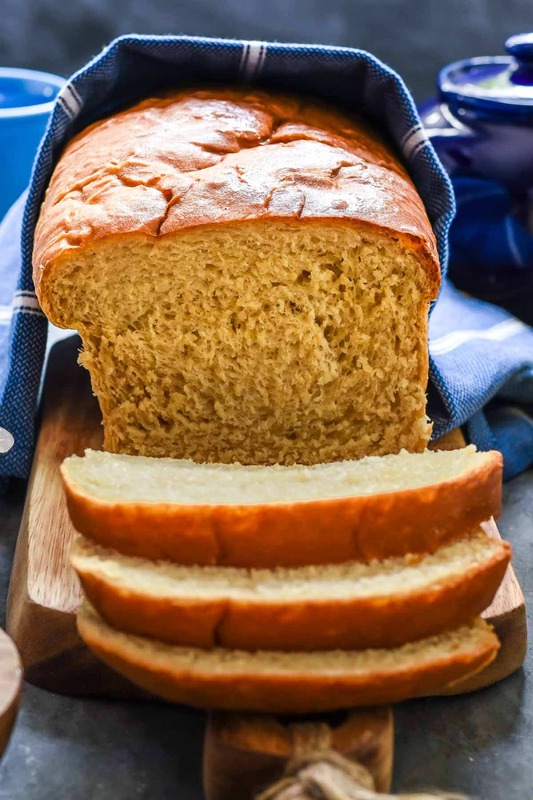 It also makes a very good whole wheat bread if you substitute whole wheat flour for half of the white flour. I recommend King Arthur Bread Flours personally. Have you found a flour that is your favorite? I also love to use King Arthur Flour in my baking. I try to stock up when it’s on sale. I”m definitely going to try it with whole wheat flour next time! 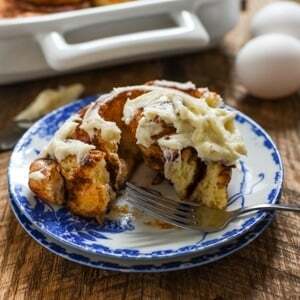 Can you also make rolls from this recipe? I’m not sure, but it would certainly be worth a try!